How are you staying ahead of your competition and providing the most value to your customers? What are you doing to not only keep your market share, but also increase it? 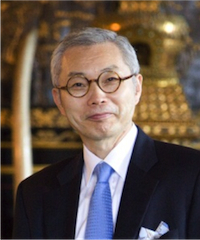 If your answer to these questions is grabbing a greater share of existing demand, where you compete with, and benchmark against, competitors based on existing industry factors, you might be stuck in what strategy management experts W. Chan Kim and Renee Mauborgne call a ‘bloody red ocean’. So how do you get out of this red ocean and swim to fresh waters where you can increase your profits and market share? 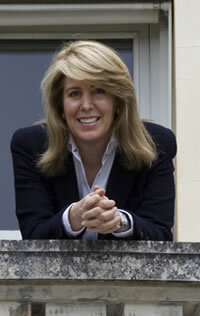 Well, as you’ll read in Blue Ocean Strategy, Kim and Mauborgne suggest your way out is in creating a blue ocean. "Blue oceans, in contrast, are defined by untapped market space, demand creation, and the opportunity for highly profitable growth. Although some blue oceans are created well beyond existing industry boundaries, most are created within red oceans by expanding existing boundaries, as Cirque du Soleil did." The blue ocean strategy has been used by companies like Cirque du Soleil to completely redefine the industries they entered by turning the conventional industry boundaries on its head. There are six fundamental principles to creating a blue ocean strategy, the first two of which are explained in the following Insights. "The first principle of blue ocean strategy is to reconstruct market boundaries to break from the competition and create blue oceans." Based on their research, Kim and Mauborgne found six approaches to reconstructing market boundaries which, collectively, are known as the ‘six paths framework’. Each ‘path’ challenges “fundamental assumptions underlying many company’s strategies”. Path 1: Look Across Alternative Industries Often products or services from seemingly different industries can be a substitute for what your company offers. Cinemas and restaurants have few features in common. But despite the difference in form or function people go to the restaurant for the same reason they go to the movies: to enjoy a night out. What are the alternative industries to your industry? Why do customers trade across them? Path 2: Look Across Strategy Groups Within IndustriesStrategic groups are usually built on two dimensions: price and performance. Toyota’s Lexus “carved out a new blue ocean by offering the quality of the high-end Mercedes, BMW, and Jaguar at a price closer to the lower-end Cadillac and Lincoln.” What are the strategic groups in your industry? Why do customers trade up for a higher group, and why do they trade down for the lower one? Path 3: Look Across the Chain of BuyersThere are a chain of buyers who are directly or indirectly involved in the buying decision; look across this chain. Bloomberg shifted focus from IT Managers (which the industry focused on) to the actual end users, traders and analysts, when developing their online financial systems. What is the chain of buyers in your industry? Which buyer group does your industry typically focus on? If you shifted the buyer group of your industry, how could you unlock new value? Path 4: Look Across Complimentary Product and Service OfferingsUntapped value is often hidden in complementary products and services. Dyson designs its vacuum cleaners to eliminate the cost and annoyance of having to buy and change vacuum cleaner bags. What is the context in which your product or service is used? What happens before, during, and after? Can you identify and eliminate pain points? Path 5: Look Across Functional or Emotional Appeal to BuyersYour behaviour as a company affects buyers’ expectations in a reinforcing cycle. Over time, functionally oriented industries become more functional; emotional industries become more emotional. Challenge this notion. The Body Shop transformed the emotionally driven cosmetic industry into a functional, no-nonsense cosmetics house. Does your industry compete on functionality or emotional appeal? If you compete on emotional appeal, what elements can you strip out to make it functional? Apple recognized the digital music trend with the rise of Napster, Kazaa and LimeWire and launched iTunes in response as it adapted to the digital music wave. What trends have a high probability of impacting your industry, are irreversible, and are evolving in a clear trajectory? How will these trends impact your industry? Given this, how can you open up unprecedented customer utility? As you can see, the key to the six paths framework is asking yourself some powerful questions that make you reassess your strategy by looking beyond what you may believe are “industry boundaries.” By looking across, as opposed to only within, industries, strategic groups, buyers, service offerings, different types of appeal and time, you get a new perspective on how you can not only reconstruct market boundaries, but also drive innovation. "Here we develop an alternative approach to the existing strategic planning process that is based not on preparing a document but on drawing a strategy canvas." The second principle in creating a blue ocean strategy is: Focus on the big picture, not the numbers. And this is best done using a strategy canvas and the 4-Step Visualizing Strategy. For example, here is Cirque du Soleil’s strategy canvas along with some of its competitors. The horizontal axis captures the factors the industry competes on and invests in, while the vertical axis captures the offering level that buyers receive across all these key competing factors. Based on their strategy canvas, you can see that Cirque du Soleil moved away from the conventional circus industry by changing the factors they focused on and how much they focused on each factor (i.e. eliminating animal shows, adding new factors such as artistic music and dance). The most important part of the strategy canvas, however, is the value curve. It shows the company’s relative performance across its industry’s factors of competition and “a strong value curve has focus, divergence as well as a compelling tagline”. 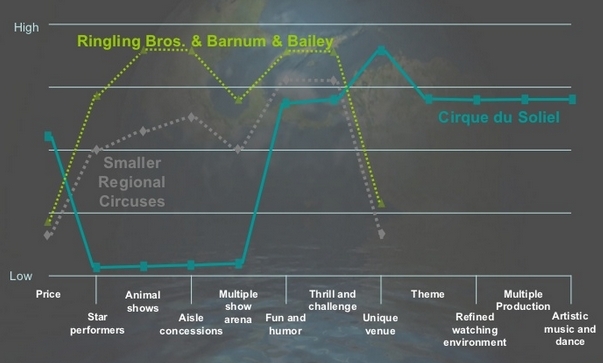 You can see how Cirque du Soleil’s value curve moved away from the traditional and conventional approach of Ringling Bros and Barnum & Bailey. They had a clear focus with new factors, and redefined the industry. Based on this, it’s not only clear that Cirque du Soleil had a very effective blue ocean strategy, but it’s also obvious how important using a strategy canvas is in defining Blue Ocean strategies. Compare your business with your competitors’ by drawing your “as is” strategy canvas. See which factors you should eliminate, create, or change. Draw your “to be” strategy canvas based on insights from field observations. Get feedback on alternative strategy canvases from customers, competitors’ customers and noncustomers. Support only those projects and operational moves that allow your company to close the gaps to actualize the new strategy. These first two principles should give you an idea about the power of not only asking specific questions that challenge your industry assumptions, but also how using a visual aid like the strategy canvas can significantly enhance your strategic planning. Blue Ocean Strategy is one of those books where no matter how much you try to summarize, there’s always more you just wish you could have included. So just do yourself a favour and read the book.